This nutrition-packed, low-calorie dish is ready in 20 minutes. You can get a healthy dinner on the table in just 20 minutes! This nutrition-packed, low-calorie recipe for Snapper with Zucchini and Tomato is perfect for those busy weeknights. 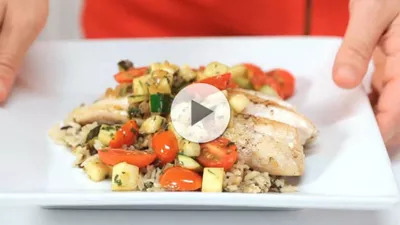 In this video, Holley Grainger, nutrition editor of MyRecipes.com, shows you how to put together this satisfying, 300-calorie meal. It calls for simple ingredients including snapper, a low-calorie, lean source of protein that's rich in selenium, vitamin A, potassium, and omega-3 fatty acids; zucchini, a weight-loss superfood that's high in fiber and water but low in calories; tomatoes, another superfood that's rich in antioxidants like vitamin C and beta-carotene; and shallot, a heart-healthy vegetable that's high in fiber, potassium, and antioxidants. This is the perfect dish for two people on date night, or you can easily double it to feed a bigger group. Try it once, and it may very well become your new go-to favorite.